Restyle a model, build a Custom, and Win! If you’ve always had the idea that you could better design a car, here’s your chance to show off your talents in scale! The revived Custom Clinic Contest is presented here so you can show off your best, most thoughtful miniature automotive designs. Chop, channel, section, mold–present your thoughtfully redesigned model car or truck kit of your choice! Don’t enter an essentially factory stock vehicle or truck with trendy graphics or just big wheels, and don’t enter a replica of a famous custom or a factory concept car. You must present a fresh, unique scale custom of your own design. Keep in mind that the model must be finished and painted, and don’t forget that photography can make or break an entry! You can enter in one of two Classes: Adult (18 and older) or Junior (17 years old and younger). You’ll need a minimum of six (6) high definition digital images (or glossy print photos if you participate by mail). Note that high resolution digital images are strongly preferred. You must also submit a typewritten/computer printed, or e-mailed, brief description (no hand-written descriptions) of why you designed your model as you did, and how you carried out the construction of your entry(ies). This contest is open to modelers anywhere in the world; Adult and Junior-Class women are heartily encouraged to enter! As in previous Custom Clinic Photo Contests, the feature on the winners that will appear in the September 2015 issue of Model Cars Magazine will include a critique and honest evaluation of the styling of each entry. Its strengths and weaknesses will be candidly discussed, but never unkindly. Winners will be selected and awards presented for First through Tenth Place (Adult) and First through Fifth Place (Junior), along with the prestigious Valley Custom Styling Analysis Award. Be sure to carefully read the contest rules, and then get busy creating your Custom Clinic Contest entry! 1) The aim of the revived Custom Clinic Photo Contest is to encourage the design and construction of original scale custom vehicles that display moderate-to-significant body modifications. Mere custom painting or adding large wheel/tire set ups does not quality a model for this contest, nor does building a replica of a factory concept car or a famous historical or contemporary custom. The custom design must be your own original work. The model must be finished–no “rat custom” entries will be accepted. No attention will be paid to engine or chassis detail, though the model must have an interior and clear glass to show the interior. Entries will be judged on the basis of the elegance of the scale customizing exhibited on their entry; the feature article on the winners will present both praise and critiques of the designs. 2) Send no less than six (6) gloss-finish color prints or high resolution digital images of your entry (no Polaroids, matte-print images, or low-resolution electronic or print images will be accepted) plus the required written description of your model (printed if you enter by mail–no handwritten text) that describes why you styled your model the way you did, and how you built it. Required photos must include low-angle photos of the left three quarter front and right rear three-quarter, an overhead view, photos of the principal body work of your entry, and anything else you’d like to photograph. Entries must be photographed against a neutral/plain light-colored background and must not be photographed in a diorama setting. Photos may not be digitally manipulated or altered in any way other than basic contrast/color correction. All photos must meet minimum printability requirements (high resolution, good depth of field, contrast, focus); poor photographs will disqualify an entry. Remember, this contest is photo entry only–if we can’t see the model clearly, we can’t judge it effectively. 3) Entry to the Custom Clinic Photo Contest is open to anyone except the editors of Model Car Magazine and its publisher. Winners agree to solely absorb any duty or tax imposed on their winnings; contest sponsors are not responsible for these levies. 4) Entries will be judged in two age categories: “Junior” for entrants up to and including 17 years of age, and “Adult,” for those 18 and older. If age does not appear on entry blank, contestant will automatically be entered in the Adult category. By entering the contest, winners in the Junior category agree to provide proof of age, if requested (no phantom “Adult” entries!). Entrants must provide their email address or phone numbers in case of a problem or question. 5). You may submit up to two entries, total (not per Class). 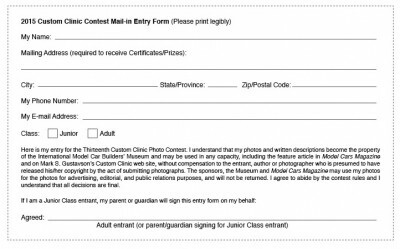 Models entered in any prior Custom Clinic photo contests in Scale Auto or Car Modeler magazines (whether or not they were winners) are not eligible. Commercial truck, motorcycles, boats powered by car engines, or military vehicles are also not eligible. 6). Upon entering PhotoCon.13, you agree to let Model Cars Magazine and the Custom Clinic Web site (www.CustomClinic.com) publish and otherwise use your descriptions and photos for all editorial, advertising, and public relations purposes and in all formats, print and electronic, without compensation, including coverage on my Custom Clinic website. All entries (photos and text) become the property of the International Model Car Builders’ Museum. 7). This Contest is void in states and countries where prohibited. By mail: Mail your high resolution, glossy prints (no borders, no matte finish), descriptive text, and fully filled-out/signed entry form below (photocopy of form is ok if you don’t want to cut up the magazine) to: Mark S. Gustavson, Revived Photo Contest, c/o International Model Car Builders’ Museum, 10271 South 1300 East, PMB #131, Sandy, Utah 84092. Entries must be post-marked no later than May 1, 2015. 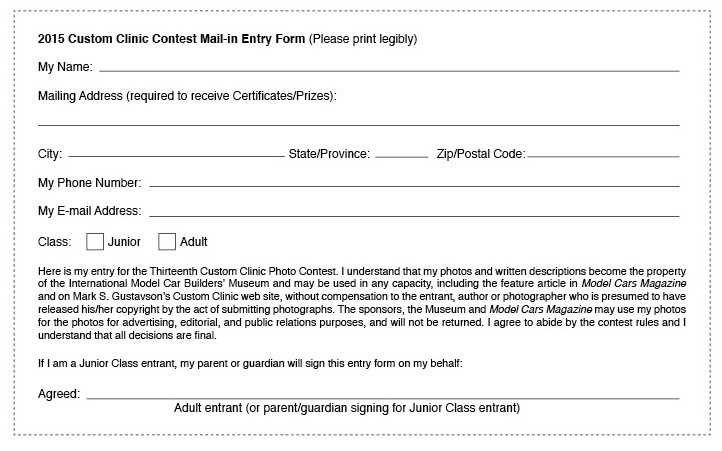 Online: Go to the Custom Clinic website (www.customclinic.com) and click on the “Photo Contest” link. Fill out the entry form there and upload your text and photos. Your text and photos will be automatically e-mailed to me. Entries must be date-coded no later than May 1, 2015. 9). The feature article on the winners of the Thirteenth Custom Clinic Photo Contest will appear in the September 2015 issue of Model Cars Magazine! 1st Place–Adult: One prize awarded–a hard copy of How To Build Championship Scale Vehicles, Construction Considerations of Building Championship-Caliber Models by Bob Wick and Mark Gustavson, a tin of Evercoat polyester putty with hardener, and a 1st place award certificate. Model will be featured on the Custom Clinic website. 2nd Place–Adult: One prize awarded–a hard copy of How To Build Championship Scale Vehicles, Construction Considerations of Building Championship-Caliber Models and a “Place” certificate. Model will be featured on the Custom Clinic website. 3rd-10th Place–Adult: a CD containing the book How To Build Championship Scale Vehicles, Construction Considerations of Building Championship-Caliber Models, and a “Place” certificate. Models will be featured on the Custom Clinic website. First Five Junior Entrants Are Winners! 1st Place–Junior: a hard copy of How To Build Championship Scale Vehicles, Construction Considerations of Building Championship-Caliber Models by Bob Wick and Mark Gustavson, a tin of Evercoat polyester putty with hardener, and a 1st prize award certificate. Model will be featured on the Custom Clinic website. 2nd-5th place–Junior: a hard copy of my Custom Car Research Bibliography and a Special certificate. All models will be featured on the Custom Clinic website. Valley Custom Styling Analysis Award will be presented to the best written overview prepared by the entrant of his/her entry. The prize for this award is a hard copy of my Custom Car Research Bibliography and a Special certificate. Honorable Mention certificates will be presented to all entrants who don’t place in the classes.